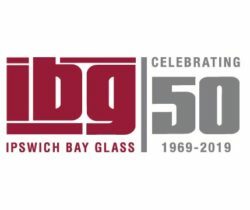 Ipswich Bay Glass, one of the largest commercial façade companies in the Northeast, is celebrating its 50th anniversary. IBG was founded in 1969 by Sandy Patrican to provide the highest quality glazing and panel systems fabrication and installation on the North Shore. Today they have several hundred employees and skilled craftsmen who are dedicated to continuing the tradition of providing the highest quality design, fabrication and installation of complex and innovative building envelope solutions. IBG’s impressive facility in Rowley, Massachusetts covers several hundred thousand square feet and is home to their design, engineering, project management, estimating, fabrication, material handling and installation teams. Ipswich Bay Glass is one of the largest commercial façade companies in the Northeast. Their expansive corporate and manufacturing headquarters in Rowley, Massachusetts is home to their design, engineering, project management, estimating, fabrication, material handling and installation teams. The facility covers several hundred thousand square feet and includes an aluminum glazing systems machining and assembly plant, a rainscreen panel fabrication plant and a full ornamental sheet metal and stainless steel shop. Products include unitized curtainwalls, stick-built curtainwalls, custom and structural glass curtainwalls, composite panels, rainscreen facades, louvers and mechanical screens, skylights, entrances and decorative metals. For additional information, call (978) 948-6644 or visit www.IBGlass.com.